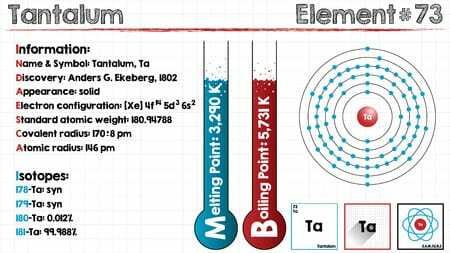 Tantalum has one of the highest melting points of all the elements on Earth. Its melting point sits at approximately 5,462 degrees Fahrenheit, which puts it behind only tungsten and rhenium as far as melting points are concerned. Thanks to its high melting point, it’s often used in everything from capacitors and vacuum furnaces to nuclear reactors and parts used to make aircrafts. There are lots of other interesting facts about tantalum, too. Take a look at a few of them below. Tantalum was first discovered more than 200 years ago. A Swedish chemist named Anders Gustaf Ekeberg was the first person to discover tantalum. He found it way back in 1802. However, at first, he believed that tantalum was the same element as niobium. It wasn’t until 1844 that a German chemist named Heinrich Rose found that tantalum and niobium were actually two different elements. His findings were backed up by further research conducted by Swiss chemist Jean Charles Galissard de Marignac more than 20 years later. It was named after a Greek mythological figure. After Rose discovered that tantalum and niobium were two different elements, he came up with the name tantalum. He named the element after Tantalus, who was a Greek mythological figure. The son of Zeus, Tantalus was punished in Greek mythology by being forced to stand in water as fruit dangled over his head just out of his reach. It can be found in a handful of countries around the world. Tantalum can be founded naturally inside of a mineral called columbite-tantalite. This mineral is most often found in places like Australia, Brazil, Canada, Nigeria, Portugal, and several other countries. Electrolysis must be used to create separation between tantalum and niobium after it’s found. One other interesting thing about tantalum is that it’s ductile, which means it can be drawn out and turned into a very fine wire. At Eagle Alloys, we can also produce tantalum bars, sheets, plates, tubing, and foil. For more information on obtaining tantalum, call us at 800-237-9012 today.